Last weekend was the biggest SSB contest of the year, CQWW SSB. I can’t believe that means it’s been over a year since my mast was put up as my aim was to get that completed in time for the contest in 2011. I had a couple of aims for this year. 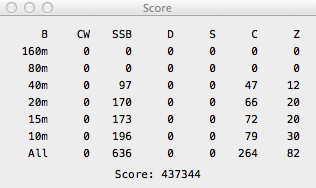 Firstly I wanted to beat my score from last year and secondly I hoped to pick up some new DXCC entities on 40m. My long term goal is to earn 5 band DXCC and I’m working my way down through the bands with 40m being next. 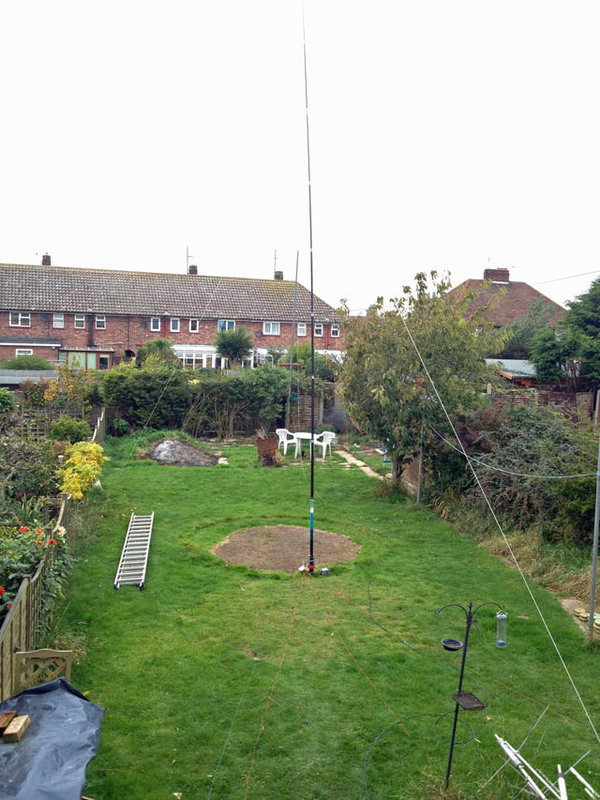 Two weekends ago I set up a 40m 1/4 vertical in the back garden, very similar to the aerial we used on Herm last month and the same as we’ve used when we’ve played radio from the beach in the summer. I used a fishing pole with the radiating element taped to the mast and just six radials draped around the garden. The brown circle is from where the pool was up over the summer, the same pool that prevented me working on the Hexbeam when it broke! I ran coax to the base of the aerial and used the balun I bought for my MA-5B after I managed to destroy the original one. I could have wound an ugly choke balun but as I had the commercial product, it seemed sensible to use it. Initially the vertical was too short so I added a couple of feet of wire to the top and this is the resultant plot from my antenna analyser. 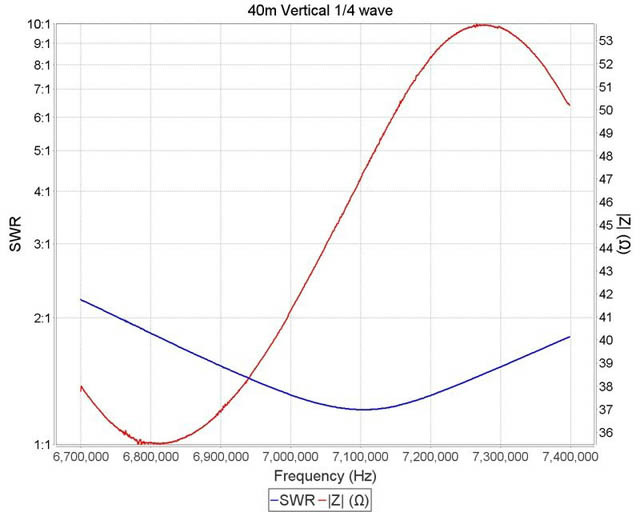 Absolutely perfect, the SWR dip was bang in the middle of the band and well below 1.5:1 over the whole of 40m. On the first evening I tried it I picked up two new countries on 40m, Belarus and Japan so I knew it was working and was looking forward to CQWW the following weekend. The contest duly arrived and I started off on 40m at 00:00z. My first QSO was with a VE3 station in Canada so I was happy the aerial was working, this was something I’d struggle to do with the delta loop. My third QSO on 40m was to an all time new one, VP2MDG in Montserrat. Over the course of the weekend I managed to work VP2MDG on all four bands I was operating on so that was good. I didn’t work too many stations on 40m in that session as I was tired and wanted to go to bed. I crashed after about half an hour having made just 17 QSOs but I was up the following morning raring to go. 10m was in good shape again, just as it was last year and I started there. I had no real plan of how I was going to operate so I just kept tuning around working stations and keeping an eye on the cluster for any new countries and multipliers. I didn’t call CQ at all, just tuned around picking stations off. At the end of the first day I’d made 219 QSOs and picked up another five new countries on 40m, Balearic Islands, Iceland, The Gambia, Saudi Arabia and Israel. I started the second day on 10m again and with the aid of the cluster my first few QSOs were Hawaii, Vietnam, China, Mongolia, Australia and Guam. I had a tune around on 15m as well picking up Ascension Island and New Zealand among others and then I turned my attention to 20m as I’d not touched it the previous day. The band was in very good shape, I worked my way from one end to the other picking up everything on the way and repeated that a couple of times. As the evening approached I beamed west and had a very good run working North American stations on 10m, 15m and 20m along with a few handy EU multipliers on 20m that I’d simply not been able to hear earlier in the day and I finally finished at just after 21:30z. 40m was still going but by that time I’d decided that I’d had enough for the weekend. So one of my aims was successful to pick up some new countries on 40m but what about the other one, to beat my score from last year? I managed to work some all time new ones as well, Monserrat, Papua New Guinea (outside of the contest) and Costa Rica and in total I worked 112 separate DXCC entities over the course of the weekend. A complete breakdown of my log is available by clicking here, I’ve submitted an entry but it’s not the whole lot – I’ve just gone for the 40m high power assisted section. This entry was posted in Amateur radio, Contesting, HF, New DXCC, SSB and tagged CQWW SSB, cqww ssb contest. Bookmark the permalink.